The Running Man is a 1987 film directed by Paul Michael Glaser and starring Arnold Schwarzenegger. It takes place in L.A. in a dystopian future in which there is a police state; there is no art or music and money is banned. There are food and water shortages and the only source of pleasure is TV. All information that is produced for and shown on television has largely been altered in some way. The most popular game show is called The Running Man. Criminals are the contestants and the object of the game is that they must navigate a labyrinthine underground rink where they must fight to the death against Stalkers whose sole purpose is to hunt and kill them. The audience gets to select the Stalker they would prefer to kill the contestant in a formula that is rather like a grim American Idol. This film is a convincing indictment of the vapidity of celebrity culture at the same time that it is an awesomely enjoyable action film. 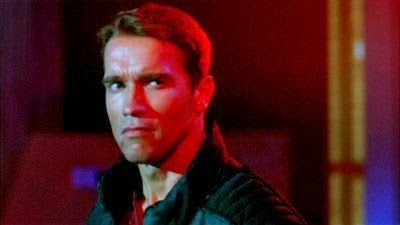 Schwarzenegger plays Ben Richards, a military man who refuses to carry out an order that would kill civilians. As a result of a cover-up and altered videotape, Richards becomes first a prisoner and then later a contestant on the show. Many of the conventions of a Schwarzenegger film abound; he carries large metal pipes on his shoulders and rips up furniture and items that are bolted down with ease. There is a woman named Amber Mendez (Maria Conchita Alonso) who he, first, in his desperation, kidnaps and then later, of course, protects. She, along with William Laughlin (Yaphet Kotto) and Harold Weiss (Marvin McIntyre), the two men whom Richards broke out of prison with, become contestants on the show after their capture. This movie is concerned with futuristic criminal justice. The game is like a trial and the audience is the jury and freedom is the reward for those contestants who complete the game successfully. The contestants even have a "court appointed theatrical agent." Yet it is the Stalkers who are the most important. There is Subzero (Professor Toru Tanaka), Buzzsaw (Gus Rethwisch), Dynamo (Erland van Lidth), Fireball (Jim Brown) and Captain Freedom (Jesse Ventura). They have and use all sorts of weapons, like chainsaws, razor sharp hockey sticks, flame throwers, and electricity to defeat the contestants. The Stalkers are major celebrities and the fans of the show throw themselves at them and place bets on their performance. The host of the Running Man is Damon Killian (Richard Dawkins). It must be said that Dawkins was made for this role, given his years of game show hosting experience. He clearly has a sense of humor about the nature of his work because he is pitch perfect as the villainous and slimy Killian. There is also an awareness of the general gawdy pomp of game shows. The Running Man features glitzy dancers that are reminiscent of the early 80s dance show, Solid Gold. The blending of bad choreography and violence is seamless and awful. More importantly, the audience is portrayed as just as awful as the dancers and host in that they are shown nearly ecstatic over the violence and mayhem featured on the show. They cheer when contestants are murdered as they perceive this as the deserved punishment for the criminals. At the same time, they seem to be unaware of the savage and awful nature of their behavior. More importantly, they are unaware that many of the images on the game show have been altered to suit its narrative. Schwarzenegger's Richards, then, is the necessary replacement for the pseudo-heroics of the Stalkers. In each scenario with each Stalker, Richard's defeats them with ease. They are no competition for him, especially when he divests them of their weapons. The audience is against Richards until they witness the cowardly nature of Dynamo. Without his electrical weaponry he is reduced to sniveling and whining, shouting, "Cut to commercial! I don't have any power!" Richards spares him and the audience begins placing bets on Richards to win. There's only one Stalker who is serious about the game and that is Captain Freedom (which has to be the most American stage name ever). Jesse Ventura is at his over the top best in this role. Captain Freedom is retired and works as the show's commentator. He's so muscular, he looks peculiar in the white turtleneck and blue blazer host's uniform. It is odd to see Ventura not baring his muscles, but in a way he does bare them as he appears to burst out of his clothing in the same way that he delivers his rapid fire manic lines. Anyway, Captain Freedom is enraged when Killian decides to digitally alter the conclusion of the game by making it appear that Captain Freedom came out of retirement to fight and ultimately defeat Richards. He insists that he will fight him in real life, shouting that The Running Man is a "sport of death and honor." Honor is the key point here. The major premise of the film isn't necessarily that media corrupts and controls the populace (although that is indeed a minor premise) but rather that people are desperate for heroes and celebrities and athletes often play that role. When Richards defeats the Stalkers, destroys Killian and clears his name, he becomes the hero. The audience celebrates and chants his name. Nothing in their horrible existence has been altered by Richards' victory but the suggestion is that it might be, now that justice and honor and truth have prevailed. Furthermore, Richards is so courageous that his bravery seems to rub off on people. Amber, who begin the game cowardly and fearful, ends up displaying a great deal of courage and also plays a pivotal role in allowing the truth about the game show to be revealed. This is also one of the few Schwarzenegger films in which there is the suggestion that one of his characters is actually a sexual being. To start, he spends much of the movie in a form fitting, futuristic yellow and grey catsuit. In a strange way, the uniform hides his physique. He seems smaller and streamlined. Though in the earlier part of the film, his massive body was on display. Despite Schwarzenegger's almost feminizing attire during the latter half of the film, the sexual tension between Amber and Ben is obvious. It comes to a head in a scene near the conclusion, when Ben suggestively asks Amber where she hid the tape that held the true footage concerning Ben's military experiences. Later, when they are victorious, Ben sweeps her in his arms and they embrace passionately. In this way, The Running Man presents an entirely new version of Schwarzeneggerian heroics while upholding the standards of previous films.